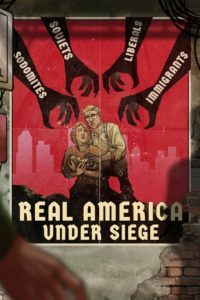 Fascists rampage freely across the United States and neo-nazis murder minorities with impunity – but enough about today’s news, let’s review Sigmata! 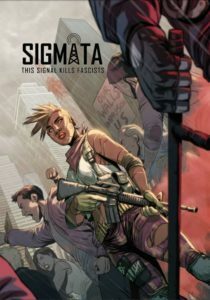 Concepts: “SIGMATA: This Signal Kills Fascists” is a cyberpunk tabletop role-playing game about ethical insurgency against a fascist regime, taking place in a dystopian vision of 1980’s America. Players assume the role of Receivers, the superheroic vanguard of the Resistance, who possess incredible powers when in range of FM radio towers emitting a mysterious number sequence called “The Signal.” When the Signal is up, Receivers lead the charge against battalions of Regime infantry and armor or serve as the People’s Shield, protecting mass demonstrations from the brutality of a militarized police force and neo-Nazi hooligans. When the Signal is down, however, Receivers are mere mortals, desperately fleeing from a powerful state that senses their weakness. It’s called the Sigmata, a Signal-induced stigmata, because it is a both a blessing and a curse. At least when you’re marked by the state, you can’t sit on the sidelines anymore. It feels almost like a redundancy to state that Sigmata is a highly political game. But it is also divorced slightly from the depressing reality of our modern world (while still being entirely contemporary and timely at the moment it was published) by opting for a retro setting. It’s set in a mirror of the 1980s – a world of 8-track tapes and 600 baud modems, with less mass communication than exist today, where information travels slowly. A typical Sigmata mission may be to hijack the analogue signal of a local news station to broadcast footage of police beating a young black man with impunity – because YouTube doesn’t exist and there aren’t mobile phones in everybody’s pocket. Writing: As befitting a game of this tone, the writing of Stigmata is razor sharp and pulls no punches. Much of the rulebook is punctuated with factual essays on ethical resistance, discussing a huge variety of subjects and techniques based around resisting State-sanctioned violence. A good collection of atmospheric pieces are included, and set the scene very nicely. There are a few spelling mistakes dotted around, but they are never egregious enough to distract from the tone and atmosphere of the piece. Without a doubt, the most important chapter in the book is a considerable segment on ethical insurgency – mandatory reading for this game and beyond. The rulebook makes extensive use of the cyberpunk tone, with significant use of programming and hardware technology. As Receivers, your characters are able to utilise subroutines – special powers enabled by the Signal. The ones included in the book are very creative, ranging from harnessing television and radio technology to do anything from watch from a distance to site-to-site teleportation, enhanded strength, slow motion and more. For fans of cybernetic-themed effects, there is a lot of potential to play with. Mechanics: Sigmata uses a fairly light mechanic for handling conflict in each scene, one which shares a great deal of narrative control between the players and the GM by establishing Exposure. Exposure is by far the most important factor in the game’s mechanic, as it creates a target for the players to meet by adjusting their choice of strategies. This allows for a strong shared narrative experience that is also sufficiently strategic. One aspect that is especially notable, which caught some controversial attention before the game’s release, is the use of factions. 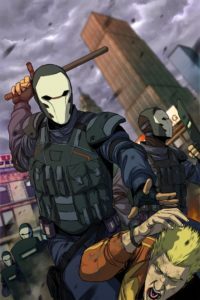 The Receivers, as powerful as they may be, are few and lack resources, and no fascist government can be overthrown by a few people alone, and part of the game is based around running missions for various different factions. Some of these factions are respectable, like the Party, whilst others such as the Old Men are little better than those in power (“But, damn it, they have what we need, so we got to make this run for them!”). To make this even more challenging, if you end up aiding any one faction so much that they grow powerful, they are able to make a grab for power themselves – so while your players may need to make a deal with the devil in order to succeed, they have to be sure that they don’t get bitten in the back while doing so. That’s an excellent and very atmospheric choice that strongly helps when running campaign games. Design: In terms of the rulebook itself, the artwork by Ario Murti is beautiful. It is both tonally appropriate and carries with it a strong atmospheric style, swerving strongly between heavily emotive and stunningly action-packed. Although the layout of the book could be made easier (if each page could, at the border, state which chapter they are, it would make it significantly easier to navigate through the book during gameplay), it is still nevertheless serviceable and functions nicely, with chapters that are laid out nicely. Everything that you need to play is included in the book, without additional purchases required. The book also includes several pre-generated characters, which help to launch the players right into the game and provide a good example of how one can structure their characters. Overall there are no complaints to the layout, and the stunning artwork elevates the design. Playability: In actual play, we found that Sigmata plays like an absolute charm. It heavily leans towards campaign play, with a strong emphasis on games centered around a specific location or city, and by co-creating this with the entire group you are able to establish a strong connection with all players. Read this as similar to Red Markets, and you can have a great foundation to a setting – once populated with the factions, you can have a game that offers all of the space for political machinations and espionage thrillers that you could possibly desire! It barely needs to be said, but Sigmata: This Signal Kills Fascists will not appeal to everybody. It will doubtless, by sheer virtue of its subject matter, be extremely off-putting to a subset of gamers – atypically those who would spent time complaining about ‘social justice warriors’, or prescribe labels such as ‘libertarian’ or ‘centrist’ to themselves. We can only consider this to be a good thing. We really don’t need them at our game table. Conclusion: Sigmata is an enjoyable and entertaining game, but more than that, it is a timely game. It is thoroughly appropriate and necessary that a game like this exist at this point in time – but the fact that it is a highly playable and pleasing experience, with considerable amount of intricacy and forethought put into it, makes it all the more worthwhile. FINAL THOUGHTS: Repeat the signal.